It’s not often that you have to host big events with a hundred or more people. Those big gatherings might occur a few times over the decades; but more often, you’re hosting intimate gatherings and small parties for the people you really care about. What better way to celebrate together than by enjoying some really delicious food? 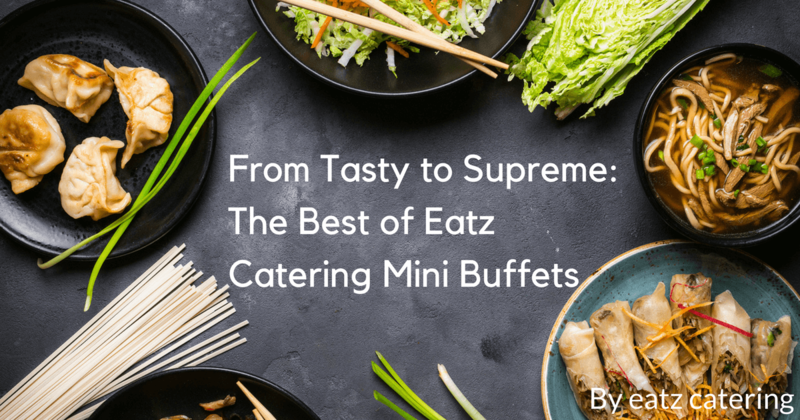 That’s why the mini buffets from Eatz Catering are some of our most popular offerings. Why Choose a Mini Buffet? Whether you’re hosting a birthday party, a lunch for coworkers, or a gathering of good friends, you want to be a part of the action. You don’t want to be stuck in the kitchen, sweating and preparing, cooking and serving. You want to put on a great outfit and mingle with the people you’ve invited! Unless you’re a master chef, the food you prepare in your home kitchen might not do justice to the occasion. You might forget about the sauce until it’s overdone, or accidentally drop a bowl of the rice you spent an hour preparing. Skip those mishaps and trust the food preparation to the professionals. You’re already saving money by hosting the event in your home or in a small venue; so why not invest that extra money in the food? As a top catering service in Singapore, Eatz Catering recognises the importance of offering something for everyone. We have mini buffets available at a number of different price points, so you’re sure to find something that suits your budget. Each mini buffet is available for a minimum of 12 guests, but you can add more people to the head count if necessary. Our most affordable buffets are the Continental Breakfast Buffet, the Singapore Set, and the Malay Set, all priced around $12-13 per person before GST. We also have inexpensive Par-Tea sets that are just $11.50 per guest, or $12.31 with GST. However, if you’re really interested in impressing your guests you might consider ordering the exotic Middle East set, which costs $25.68 per guest with GST, or one of the fabulous Premium Sets, in the range of $20-25 per person with GST. Our ultimate mini buffet, the most luxurious menu we provide is the Supreme Set. It’s the menu you order when you want to show a group of people just how special they are; and it’s what you want when the occasion calls for an especially extravagant feast, like the New Year. The meal begins with the Prosperity Cold Platter, a beautifully arranged selection of marinated prawns, marinated sesame jellyfish, sliced smoked duck, and seasoned baby octopus. After these delicacies, your guests can indulge in Prosperity Soup, a braised fish maw soup with Conpoy, shredded chicken, and tender crab meat. Next comes the Prosperity Premium Pot, containing 12 pieces of braised whole abalone along with sea cucumber, Japanese mushrooms, and broccoli in superior broth. The entrees are equally decadent, with butterfly roasted chicken, steamed red snapper fillets, fried golden prawns with salted egg yolk, and Cantonese prawns wrapped with beancurd skin. Above all these delicacies shines the highlight of the meal, our Signature Eight Treasures fried rice. As a Halal caterer in Singapore, we ensure that the Eight Treasures rice is safe for everyone to eat by including ingredients such as chicken ham, Chinese chicken sausages, prawns, Pacific clams, carrots, and golden eggs. To end the feast, you guests will enjoy our magnificent Prosperity New Year mango cakes and our Teow Chew Yam Paste with gingko nuts and coconut milk. To order the extravagant Supreme Set, or to place an order for any mini buffet, visit Eatz Catering’s website or contact us directly with your questions.